For ten years, French start-ups have been revolutionizing carpooling and care renting between individuals. Blablacar, Drivy and more recently Tripndrive have joined the race for the conquest of international market. 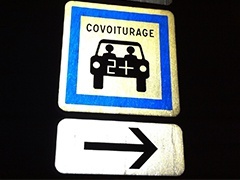 In 2006, Frenchman Frédéric Mazzella bought the website covoiturage.fr. The system, that offers its users to join for a travel in order to pool car travel expense, was far from working. Payment was made in person. A third of bookings ended up in withdrawals. Business model moved between advertisement and registration with no conclusive model appearing. Only in 2011 did the start-up find the winning formula. Under the name Blablacar, the company specialised in carpooling chose online booking and payment. Blablacar reused the model of Airbnb, a well-known website of house renting between individuals, and applied a 10% fee on transactions. Today, the little company is leader in carpooling in Europe, with over 10 million users. The success story of Blablacar had inspired other French entrepreneurs. Paulin Demanthon, a HEC graduate, turned the process started by his competitors into a business concept: he created a car renting service between individuals. Drivy was born. Started in 2010, the interface now registers over 500,000 users in France alone. Even more recently, in July 2013, three young entrepreneurs, François-Xavier Leduc, Arthur de Keyser and Nicolas Cosme created Tripndrive. Once again, the idea is a simple concept: everyday, in France, 18,000 cars sleep in airport car parks. At the same time and place, 6,000 cars are rented to individuals. Why not put these travellers in contact? The first save parking fees and the second benefit from a car rent for a preferential fee. The concept is a success already: it is available in about ten French railway stations and airports. The common ground of these start-ups? They grow at incredible pace and aim for the international. In June 2014, Blablacar won a fundraising of an exceptional total for a French start-up: 100 million dollars. Already present in about ten countries, the carpooling service is now investing in Turkey and India. Drivy wants to reinforce its leading position: after having bought its main competitor Buzzcar, the start-up wishes to conquer the European market. To finance its international development, it is looking for a new 40 million Euros fundraising. Tripndrive is not done yet: after a fundraising totalising 800,000 Euros, the newest company on the market of car-sharing wishes to deploy in Spain and Italy.